Holiday safety and sanity from now through New Year’s is all about good advance preparation. 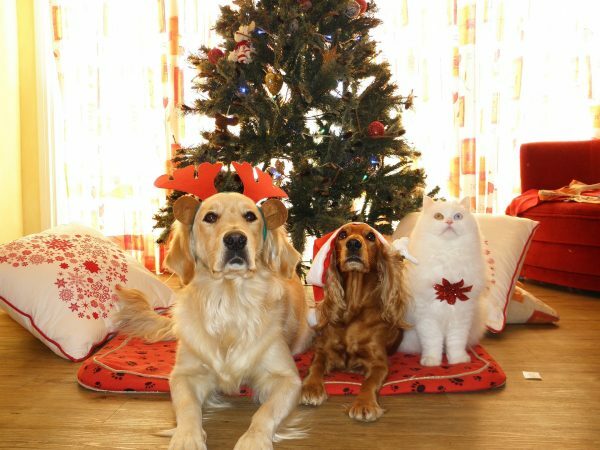 If you leave your pet preparations until the night before the party, you are sure to be stressed out and your pets will be too! It goes without saying that all of the candy, rich foods, alcoholic drinks, etc. are a danger to our pets. Plus, they are often right in our pet’s reach making it an even bigger risk. Think ahead…have drinks and food served in a room where your pets cannot go. Use baby gates to block off forbidden areas. If you must have food at their level, keep your dog tethered to a family member so that that person can keep an eye on the dog and stand on their leash and/or redirect, away from the food, when necessary. You can switch off who is in charge of the dog so no one person is “stuck watching the dog” the whole time. If you put up a Christmas tree, make sure it is secure and can’t be tipped over or climbed on. You can even try putting an exercise pen around your tree like a corral to keep it safe from exploring pets. Just refrain from decorating the pen as that will attract them as well! Make sure ornaments are securely attached to the tree. Glass ornaments, if used, should be positioned up high, out of reach, so that they can’t be knocked off, broken, and eaten. Do NOT hang food on the tree like popcorn, candy canes, gingerbread men, or dough ornaments that smell good enough to eat and will attract your pets. Refrain from using tinsel which is a choking hazard and protect the wires on the lights from curious animals who might chew on them. You will want to think about the gifts under the tree as well. Wrapping paper and ribbons are fun to tear into! Plus, candy and food gifts smell enticing right through the packaging making them unsafe for curious pets. And if you wrap your pet’s gifts, remember that they can smell those too! Keep in mind that traditional holiday plants like holly, poinsettias, lilies, narcissus, amaryllis, and mistletoe are all toxic, potentially causing severe gastrointestinal distress, cardiac arrhythmias, kidney failure, convulsions, and even death. And don’t let them drink the water from under the tree. The additives given to preserve your tree are not meant to be consumed! Try to set up a safe haven for your pet in advance of holiday parties, gatherings, loud activities, etc. It could be their crate or an exercise pen in a bedroom or laundry room. Or maybe just confining them to a bedroom where they enjoy spending time. You can use white noise machines, fans, TV’s, or music to block out any ambient disturbing noises. Give them something fun to do while they are there so they don’t feel like they are being punished. You can even use lavender spray in their safe room as lavender enhances relaxation, or put lavender springs inside their zipped closed bedding as well. Adaptil plug ins and collars, which utilize dog appeasing pheromones, can also help enhance relaxation and decrease anxiety. They work best in small spaces like enclosed rooms or near crates. Doors are likely to be opened and closed frequently and even left open inadvertently during the hectic holidays. Dogs should be on leash for guest arrivals if they might bolt out an open door. Make sure all pets are wearing their collars and that their tags are up to date as well as their microchip information. In general, try to keep your pet on their regular schedule as much as possible. Everyone is busy, but your dogs still needs their walks, regardless of the weather. Even if they don’t like walking in the rain or snow, they still need exercise, both mental and physical. They need to sniff and explore! And don’t neglect one-on-one time with any of your pets. It’s good for them, and it’s a good stress-reducer for you as well. If you are introducing your pets to new people, take it slow. You can let guests give them treats IF you are reinforcing calm/friendly behaviors. You don’t want your guests giving them treats if your dogs are anxious as giving the treats then simply reinforces the anxiety! Keep your dogs on leash at the front door and stand on the leashes so that they don’t jump up on guests. Or have them tethered away from the door or behind a gate so your guests can come inside your home without issue. Finally, if you are taking your dog with you to someone else’s home, make sure they are up for this kind of challenge. The only dogs who should be houseguests in someone else’s home are those that are housetrained, don’t suffer from separation anxiety, aren’t incessant barkers, and can be crated or confined when needed. Anxious or ill-mannered dogs do not make good houseguests! And if you want to deck your pets out for the holidays, make sure, in advance, they enjoy their festive duds. Hopefully, they will be as tolerant as these two. 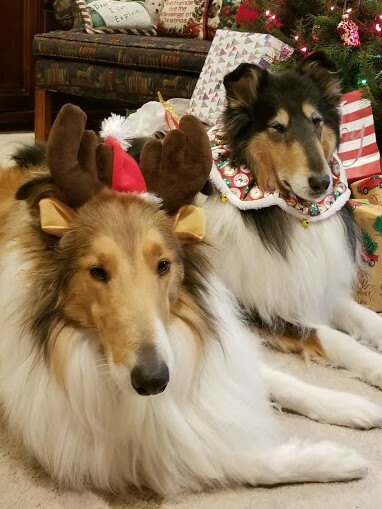 Happy Holidays to you and your furred and feathered companions! That’s What She Said | Is It Better to Be Skinny or Sane?